The final moments aboard Southern Airways Flight 242 were chaotic yet controlled: the first officer was searching in vain for a suitable runway; the pilot was furiously trying to restart the disabled engines; and the two flight attendants were keeping the unnerved passengers calm and focused during the hurried preparations for an unlikely forced landing. First Officer Lyman Keele, Jr., a former Navy fighter pilot with more than 100 combat missions under his belt, had to quickly master the art of piloting a fully disabled McDonnell Douglas DC-9 after they lost both engines in a hailstorm – only 16 minutes after takeoff. 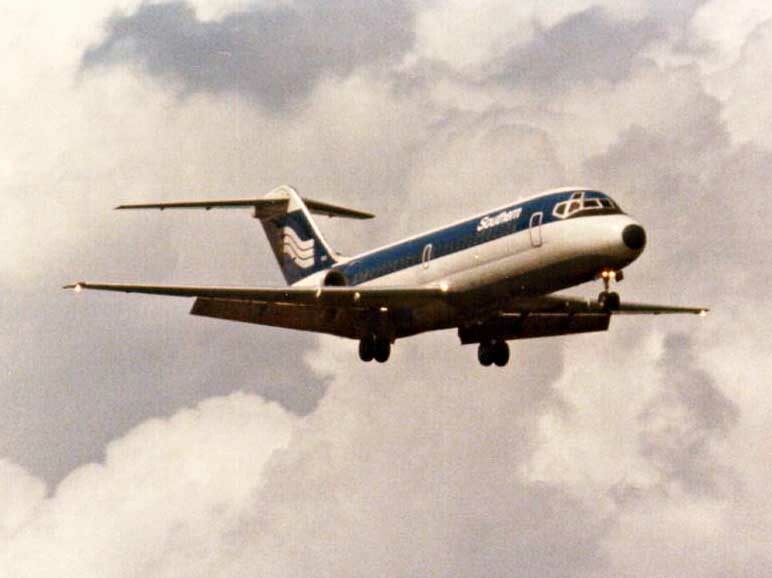 The glide ratio for a DC-9 is approximately 15:1, depending on the weather conditions, so when the plane lost thrust at 17,000 feet, he had to quickly find a landing site. But after piloting the powerless aircraft for eight minutes in a free-falling glide, he finally ran out of time. Keele was forced to make a “dead-stick” landing on a narrow, tree-lined, two lane highway located in rural New Hope, GA. The National Transportation Safety Board performed the accident investigation after the April 4, 1977 crash. As part of their process, the NTSB conducted a series of interviews with a group eyewitnesses on the ground. Their testimony documented everything from the horrific hail storm that the plane encountered over Rome, GA, to the final moments before the DC-9’s disastrous forced landing. Taken together, the five NTSB interviews below provide a portrait of the stricken aircraft as it dropped from the sky, tracing its erratic path until it finally crashed and burned, killing 63 people aboard the plane and 9 others on the ground. I arrived home around 3:00 or 3:15 P.M. on Monday, April 4, 1977. My wife Sandra, who teaches school at Cave Spring, GA which is south of our home, came in around 3:35 and told me the superintendent of schools for Floyd County had informed their school principal to allow the students to go home early that day because of tornado warnings. I heard an EBS (Emergency Broadcast System) alert on our radio at about 3:35 relating to a tornado that had been sighted near the Alabama-Georgia border in the vicinity of Piedmont, Alabama and moving in our direction towards Floyd County. The black clouds started to form about 3:45 P.M. and we were quite concerned because our daughters were not home. I am relating these details only because our concern for our daughters makes it possible for me to pinpoint the time I am stating within a minute of two. My wife and I really became uneasy after the EBS alert. I’ve been in broadcasting for 17 years and this was the first time we’d ever had a real alert. Just as it began to rain, the darkness was unreal—it was just like nighttime. It’s only about 4 o’clock and it is pitch black outside. It was calm and quiet at this time, not a tree or twig was moving. It was just super quiet. Then the rain started. In the beginning it was just like a regular rain, not like a blowing thunderstorm. The rain continued about two minutes and then my daughters came riding up and rushed into the house from the driveway. The rain became extremely heavy. I have never before seen rain of such intensity, and it lasted about 15 minutes. The hail started at about 4:20 or within a minute or two of that time and it was more like chunks of ice falling out of the sky. It lasted about 15 minutes. We had the chunks of ice and the little pebbles of ice you normally see and the hail covered the ground and our deck. The noise was unreal–the wind was blowing very hard with lots of thunder and lightening. 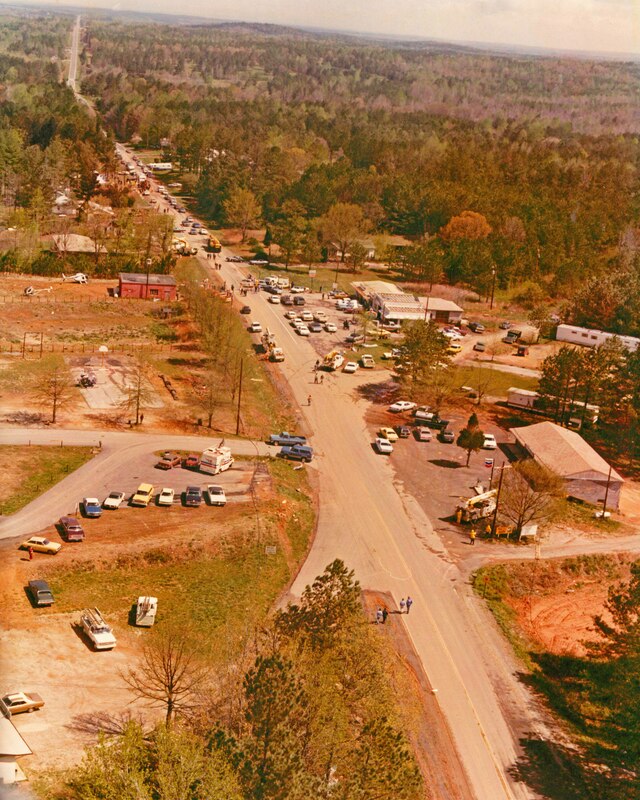 Highway 92 Spur in New Hope, GA – the forced landing site of Southern Airways Flight 242. I left the school with my son at about 2 or 3 minutes before 4 P.M. on April 4, 1977. We went to the Professional Building which is located about 3 blocks from the school. At about 4:10 P.M. to 4:15 P.M. I was standing out in back of the Professional Building with Dr. Smith, a local dentist, and we were looking at the clouds. We saw a large commercial passenger plane which was circling from the east to the west. It was in a steep bank in the west. It was banking from the left all the way around. He made this huge circle back in towards Dallas or the Atlanta Airport, in that general direction. That would be east. We watched it for about 3 or 4 minutes. I did not notice any colors with regard to the plane. If I had to estimate the height, I would say it was about 15 to 20,000 feet, but I am poor at estimation. I did not hear any noise nor did I see any smoke or fire, or lights. When I last saw the plane, it was heading toward the east. It had made a huge circle from the time I first saw it. It definitely was angling downward as though he might be going into the Atlanta Airport or something like that. The plane’s bank seems to have been corrected, but it was definitely angling downward. I was in my truck on the top of Cemetery Hill when I spotted the aircraft maybe a mile northwest of the cemetery flying in an east or maybe southeasterly direction. I estimate the plane was about 3,000 to 5,000 feet high. It was traveling very slow in a straight “wings level” attitude and there was absolutely no sound from the plane. It was completely quiet and slowly dropping or losing altitude. It proceeded in a line that took it slightly right of the county landfill (the landfill is visible from Cemetery Hill). About a half mile before it passed from my view over the ridge beyond the landfill I saw the landing gear come down. I thought he was going to crash on this side of the ridge, but the plane pulled up real sharply and did about a 45 degree turn to the left and went over the hill–and that’s when I heard the explosion and saw the smoke. I looked up and saw the plane coming towards me from the right up that way (indicating with his hands a northwesterly direction). He looked like maybe he was 300 feet high—I’m guessing—but he looked that high to me. He put his gear down directly overhead, went along a little ways, and started his left turn and then went down behind the trees. I didn’t hear any power from the engines, and they just sounded like a jet with air going through them. I just don’t think he had any power. I thought he was turning to get lined up with the road (Highway 92) because it’s almost straight from here all the way down to the four-lane. When he passed overhead and put the gear down I watched the nose gear come down. I don’t remember seeing the wing gear come down, but I figured he was fixing to set it down on the road or he wouldn’t be dropping the gear. I was sitting in my store when I heard a noise that sounded like a tornado and I jumped up and looked out to see the aircraft coming through the trees right over the highway in front of the store. The left wing clipped some telephone poles but it touched down right in the middle of the road. Then the left wing and flap got caught in the bank between the road and the school and that picked it back up and it set down again over in front of the Fire Station. All of the wheels were down and the flaps were down. I thought he had it made, and if he hadn’t started hitting those things with the wings that threw him off he may have—but he was moving fast, had lots of speed. I didn’t see smoke or anything trailing from the plane when it passed my store. This entry was posted in The Tragic Crash of Southern Airways Flight 242 and tagged Jr., Lyman W. Keele, New Hope GA, Southern Airways Flight 242. Bookmark the permalink. Great story to a piece of history which the eye witnesses will never forget! Thanks for your comment, Tiffany. As the daughter of First Officer Lyman W. Keele, Jr., I hope you will be able to come out to New Hope, GA this April for the 37th anniversary memorial service. Of course I will come out in April. Again, thank you for everything! It feels unreal to read this, knowing that the next thing in the lives of so many of those passengers and crew is death. These accounts are tales of those “last of life” moments, and it is heart breaking. What a tragedy to read about those lives lost during this incident. You have detailed this event and captured the sentiments of those who witnessed such loss. I have been privileged to hear those songs that passenger Annette Snell recorded in Muscle Shoals just before she died, and was captivated by her talent. Thank you for sharing this piece of history, and that of the passengers and crew, along with photographs. I found this story very interesting, and a great read. Bless those whom we lost, their families, and bless you. I know this is a relatively old post, but for some reason I woke up today thinking about the New Hope crash. My grandparents lived in the white trailer on the right side of first picture above (the one on top, more visible). I grew up going to all those stores, playing baseball on the fields behind the New Hope school. I was 10 years old and living in Dallas, GA that day. My mother was on the phone with my grandmother when my grandmother said, “Oh my God!” and then the phone went dead. It took 30-45 minutes or so before my mother was able to get in touch with my Aunt who lived a few miles west of New Hope. Frantically, my mother got me and my younger brother and sister in the car and we drove towards New Hope. Newman’s store was a regular stop for my grandfather on days he was ‘loafing’ and catching up with friends. We didn’t know if he was there when the plane crashed. In my 10 year old mind I expected to see something like a Cessna plane embedded in the roof of the store with the tail sticking out. As we got closer to New Hope we saw fire engines and ambulances lined down the road. We parked and walked the last few hundred yards to the trailer. My grandfather was fine. He was the one that heard a noise and opened the front door of the trailer. My grandmother, sitting in a chair next to the door looked out to see the DC-9 go by about 75 yards in front of her door, taking out the phone lines. My grandfather and a mix of uncles and older cousins were at the crash site within minutes. They saw some pretty horrific things, and I still have images from their stories in my mind today. It was certainly a major milestone in my life and still a bit surreal to think about the day a plane dropped on our little out of the way corner of the world. I can’t explain why the story of this event fascinates me so. As a pilot, I’m drawn to documentation of crashes. Some have stuck with me more than others. But there is something about this one that has captured my attention in a odd way. I’ve read a great many online stories about it, I’ve watched “Southern Storm”, and I’ve viewed probably every online photo there is. I’ve read Eddie Burkhalter’s poignant account written from the perspective of a very young child. I was a junior in high school in 1977. I can’t even say that I specifically remember the event when it happened. But some years back, I remember hearing/reading about the airliner that crash landed on a Georgia highway. I travel to the Atlanta area on business from my home in North Florida several times a year, I generally stay in Gwinnett during my visits. My latest trip was in early-November 2016. I had a few free hours on the afternoon of November 10th and decided to make the 45 mile drive out to New Hope to visit the site. I stopped in the parking lot at the west side of the Publix store before driving out to turn north onto Dallas-Acworth Highway. As I pulled out onto the highway, I was hit with a tremendous sense of…I’m not even sure what it was: A combination of awe, sadness, and respect. Awe because I realized that my field of vision was pretty much the last thing that Captain McKenzie and First Officer Keele saw. Sadness for obvious reasons. And respect for those who lost their lives and those who lost loved ones, as well as for those that witnessed the horrible event and/or dealt with the aftermath. I pulled into the parking lot of Rodney’s Bar-B-Q and just sat there for five minutes or so. I got out of my car and took a photo from the roadside looking north, one of the karate school and the house on the northwest corner of the Dallas-Acworth/Bickers intersection (which I had seen in photos). I wanted to walk the shoulder of the highway. But I was afraid that I would be viewed as some sort of “weirdo” or whatever. I couldn’t help but wonder about the number of cars that drove past. How many drivers and occupants are unaware of what happened that day in 1977? Some? Most? Nearly all? I drove north a mile or so, turned around, drove back south, turned west onto Bickers Road, then onto Old Cartersville, to Bone Circle, then back to Dallas-Acworth for one more slow drive south pausing in front of the old Burkhalter home. I then turned left onto Due West Road for the two hour drive back to Duluth. That’s my story. My heart breaks for everyone whose lives were touched by this horrific event. Mr Davids: Thank you so much for this story. Dot St. Martin was my mother’s cousin as well as Sheila. I clearly remember when this happened to Bob and then the account with Shelia as well. I had graduated high school in 1975 and it seemed like all my friends and family were going through a lot. One of my best friends died in a motorcycle wreck, another one committed suicide…and then Shelia. According to what we were told at the time, she may have been hit by several cars or trucks. There was no open casket. Shelia was a very pretty young lady. The boys went and lived with Bob’s parents, if I remember correctly. I knew Bob and Dot had problems, as all married couples do, but I think what happened here was a combination of a lot of things. Did I hold Bob responsible – yes I did. Were there more people at fault – there sure were. It was a sad time for all of us, including both families. Death and murder-suicides have an effect on all of us. By the way my name is Ned Kocher, and my mother Norene Ogburn Kocher was Darthie’s first cousin.